In addition to boasting the latest and greatest in technology, Biltmore required an exceptional team of domestic staff to ensure the house operated like a well-oiled machine. In the days when George, Edith, and Cornelia Vanderbilt resided at Biltmore, they employed up to 40 staff members who each played a crucial role in the day-to-day operations of the house and stable. With large house parties of guests coming and going throughout the year, Biltmore functioned more like a luxury hotel than it did a house. As soon as guests arrived on the estate, the domestic staff made sure that each and every one of their needs were met. George Vanderbilt not only provided room, board and uniforms to his staff, but he also compensated his employees with New York wages, a substantially higher rate than the Asheville standard. Staff wages could be up to $2 for higher ranking staff, which is substantial given that a week of room and board typically cost $2.50. Demographically speaking, the domestic staff was majority female. While many of the servants were native North Carolinians, there were also a number of employees from around the globe including an English Head Housekeeper, a French cook, a Swedish laundress, and an Irish Butler. The domestic staff members were classified into two groups: upper and lower staff. The higher the ranking, the more defined the responsibilities of their role. While each member of the staff provided invaluable service to the Vanderbilts, there were a few upper roles that maintained the standard of service and hospitality Biltmore is renowned for. 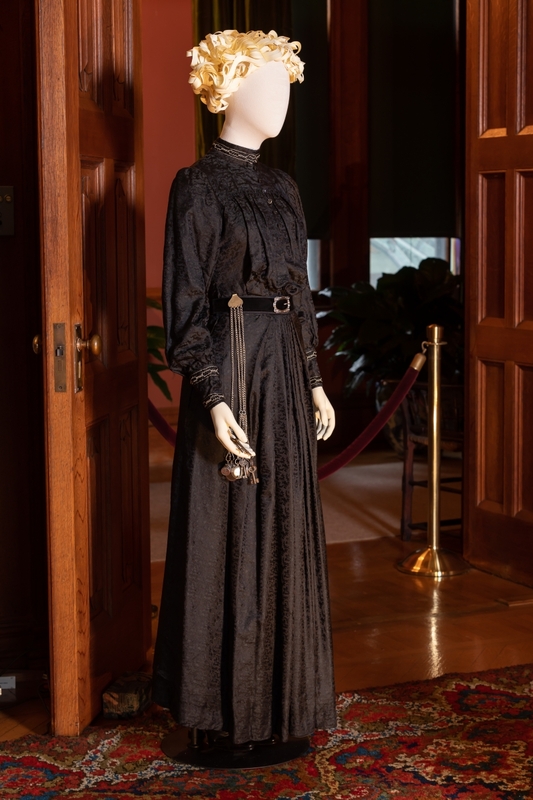 The wardrobe of Biltmore's Head Housekeeper was recreated for the exhibition A Vanderbilt House Party - The Gilded Age, and even included chatelaine (an accessory used to carry keys) the Head Housekeeper would wear at all times. At Biltmore, the Head Housekeeper was among the highest ranking staff members, and the chief female servant. She reported directly to Edith Vanderbilt at Biltmore. Whether she was single or married, the Head Housekeeper was always addressed as “Mrs.” out of respect. The Head Housekeeper supervised all lower ranking female staff, with the exception of the Chef’s kitchen staff. She oversaw the cleaning of the house, household inventory, and held keys to the storerooms, pantries, china closet and still room. The Head Housekeeper typically dressed in a black dress. 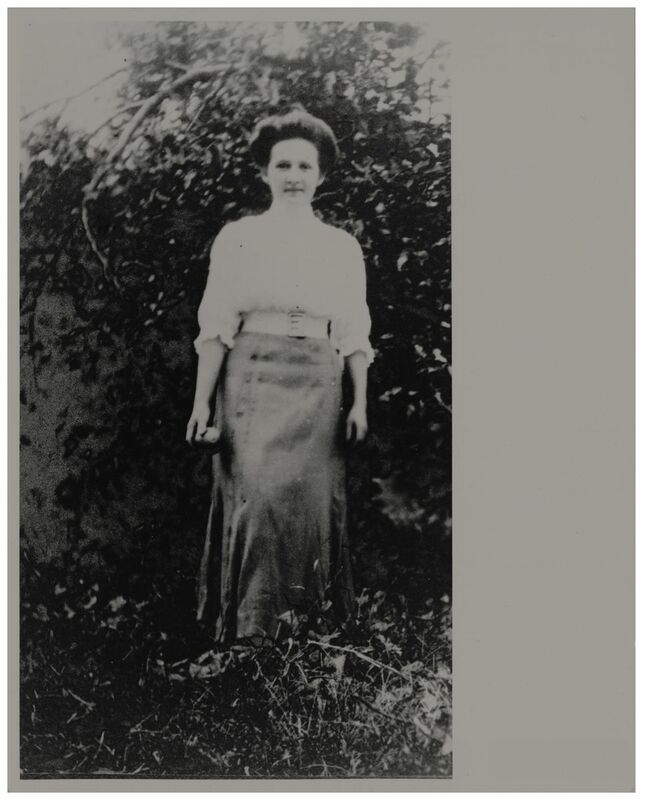 Read more about Emily King, one of Biltmore’s first housekeepers. As the highest ranking male staff member in Biltmore, the Butler was responsible for all lower ranking manservants. His primary responsibility was to ensure that Mr. and Mrs. Vanderbilt and their guests were seamlessly served three meals daily, as well as afternoon tea. Other duties of the Butler: creating floral arrangements; overseeing the storage, decanting, and serving of wine; maintaining the clocks; greeting guests upon arrival; and assisting with the departures and return of Mr. and Mrs. Vanderbilt, as well as their guests. The Butler’s livery was formal, and often included a coat with tails and multiple monogrammed buttons. An archival photograph of Edith Vanderbilt's Lady's Maid Martha Laube. Photograph courtesy of A. Babette Schmid Schmaus. The Lady’s Maid served as a personal companion to Edith and/or Cornelia Vanderbilt. The Lady’s Maid traveled with her mistress and managed her correspondence, and she was also responsible for dressing her mistress and combing her hair. The lady’s maid was also expected to be quite skilled at sewing, as her responsibilities included mending and packing Mrs. Vanderbilt and Cornelia’s clothing. Instead of a uniform, the Lady’s Maid wore dresses gifted or no longer worn by her mistress, which was regarded as a privilege. The lady’s maid was referred to by her last name. The valet was one of the older and more experienced members of the male staff (typically in his 30s) who reported directly to George Vanderbilt. The valet traveled with George Vanderbilt and attended social functions and events with him. The valet would be familiar with foreign languages, and be an expert of fishing and hunting to assist Mr. Vanderbilt. He did not wear a uniform and, like the lady’s maid, he was addressed by his last name. Read more about George Vanderbilt’s personal valet here. 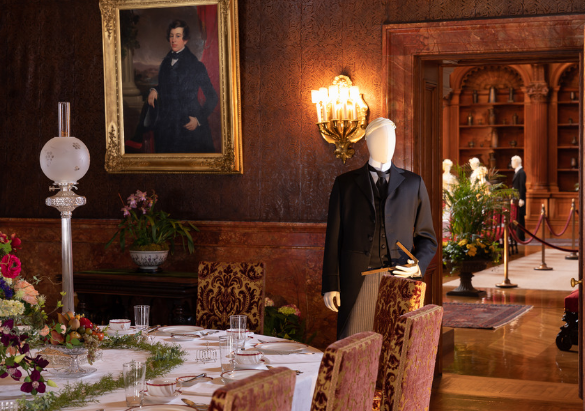 Experience Biltmore House as if you were a cherished guest of the Vanderbilts in our latest exhibition A Vanderbilt House Party – The Gilded Age. For a more in-depth look at servant life at Biltmore, guests can enjoy the Biltmore House Revealed tour. Join us February 8 through May 27 for this one-of-a-kind exhibition featuring immersive audio storytelling and displays of elegant clothing recreated from archival Vanderbilt photos and portraits.